Brace yourself, there's very nearly proper analysis in this post. Nearly. This week's release of Modern Warfare 2 is set to become the fastest selling video game ever. The hype around a big release builds over a long period, so if it was me, where would I put the marketing money? Start really, really early and try to build critical mass? Release it and then spend the cash? Or something in between. Sounds like a job for Google Insights. Lets have a look at what people do on Google before, during and after a game launch. This list gives us the top ten fastest sellers ever, so we know what we're working with. Google's good for this because it shows when people are actually interested. You might be throwing in advertising money, but are people in the mood to respond? Line up the search data so that all the titles launch on the same week (and drop the older versions of games that are in there twice) and let's have a look. Well, that was fun. First thing that strikes me is how similar they all are. Modern Warfare is definitely big, but that's not completely fair because quite a few of the others have got common abbreviations of their names that would give them more searches (Pro Evo 6 or GTA for Grand Theft Auto.) The shapes are very similar though, building together to a spike at launch. 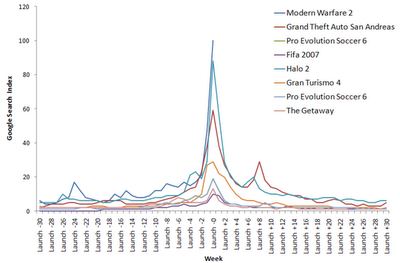 Halo and Grand theft auto both had a little rally post launch in about week 8, but overall, pretty close. Enough coloured lines, lets normalise the whole lot to give them equal weight and then average all the releases. Now that the clutter's out of the way, it's striking how fast the searches drop off. You're not flavour of the month, it's more like flavour of a few weeks at most. 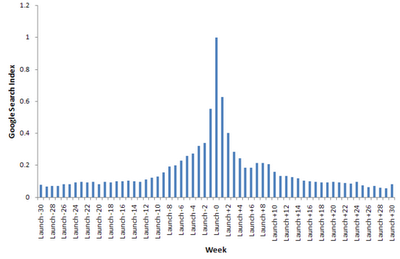 The little bump around week 8 is Halo and GTA again. OK, so where does the ad money go? People actually searched continuously for Modern Warfare 2 from December 2008 all the way to launch this week so there's definitely a groundswell. They've got to be seriously motivated to be looking for you back then though and will snap up even the littlest news... Not worth a lot of effort for me, but teasing on some gamers forums once in a while would keep them keen for free. That's not quite the end. Overall searches can be all sorts of things without being purchases. Is it worth carrying on much post launch? The charts so far suggest not really and it all happens in a short, big hit. I'd like to see some data for terms like 'Buy Grand Theft Auto' but unfortunately if you try it, Insights defaults to monthly because it thinks there's not enough data. Please stop it Google, it's annoying. If the data's unstable, I'll behave with it, promise. Biggest selling is dominated by Nintendo, making games where the graphics matter less and the gameplay matters more, so they can sell them for less and over a much longer period.